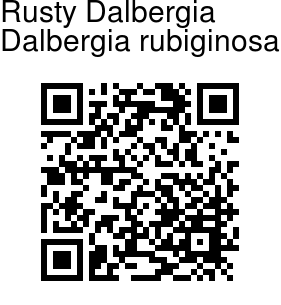 Rusty Dalbergia is a large woody climber, running over the highest trees. Bark is rust-colored. smooth. Branchlets are alternate, two-faced, winding, short, rigid and erect. Alternately arranged leaves are compound, 4-6 inches long. Leaflets are generally three pairs, alternate, stalkless, oblong. Outer leaflets are larger than the inner ones. Leaf-stalks are round, velvet-hairy. Stipules are oval, small, covered with dirty-green minute hairs. Flowers are borne in compound spikes in leaf axils. 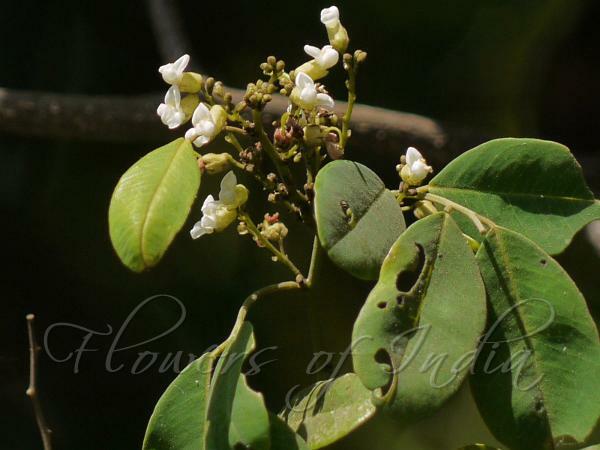 Flowers are white, shaped like pea-flowers, with a rather large sepal tube. Photographed along Anshi Ghat, Karnataka.